Meyer Components Serve Many High-tech Projects - Meyer Tool & Mfg. 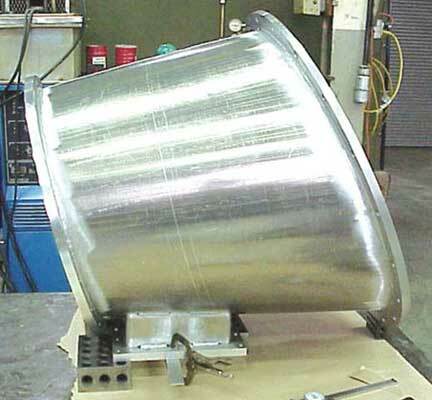 Meyer Tool & Mfg., Inc. (Meyer) continues to produce cryostats for the astronomy community. The latest experiment being supported by Meyer-manufactured pressure vessels and components is the Faint Intergalactic Redshifted Emission BALLoon (FIREBall) project. FIREBall is a balloon-borne experiment designed to map the Intergalactic Medium. According to Sarah Tuttle of Columbia University, the project is comprised of a 1m telescope (constructed by CalTech) and an ultraviolet fiber-fed spectrograph (constructed by Columbia University), using Meyer-fabricated aluminum vacuum vessels. The intergalactic medium is a diffuse warm plasma (~106 Kelvin) that spreads throughout the universe and traces not only galaxies but also the initial distribution of dark matter. Past studies have been done using line of sight studies, but this project will allow the investigators to map the intergalactic medium at three redshifts (z=0.33, 0.6, 0.9). This approach is much better suited to the IGM, sometimes called "The Cosmic Web," for its large-scale nature. Columbia hopes to use the results from their first flight to constrain metal and baryon content in the local universe, as well as to study metal outflows from galaxies and galaxy clusters. Meyer has also built a second Quiet Cryostat for Columbia University. This cryostat for the QUIET (Q/U Imaging ExperimenT) experiment, is a joint effort of a consortium from eleven universities and labs. Meyer's engineers again worked with Columbia University's Laura Newburgh. For more information on the QUIET experiment, reference Cold Facts December 2005, Vol. 21, No. 5. Meyer has also been informed that the South Pole Telescope Instrument contained by the Secondary Cryostat built by Meyer (Cold FactsSummer 2006, Vol. 22, No. 3) has been successfully installed at the South Pole and is providing data to the experimenters. Meyer has just completed manufacture of key components for Cornell University's ERL Horizontal Test Cryostat. Cornell's Laboratory of Elementary Particle Physics (LEPP) and Cornell's High Energy Synchrotron Source (CHESS) have developed a Cryomodule for the Energy Recovery Linac (ERL) Injector. It will consist of five 2-cell superconducting RF cavities, with two input power couplers per cavity and Higher Order Mode (HOM) absorbers between each cavity. The concept for this Cryomodule is based on the TESLA Test Facility (TTF) at DESY generation III Cryomodule, but with important design changes to accommodate the challenges of continuous wave (CW) operation, high beam current, and beam emittance preservation. ​The components built by Meyer in this initial contract are for a one-cavity test Cryomodule based on the same principles as the final five-cavity module. 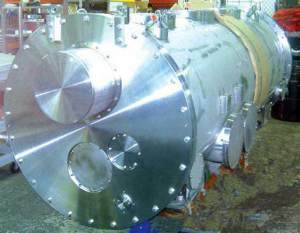 The basic concept of this test cryostat is very similar to the TTF III Cryomodule, with the cavity hanging from the He-gas return pipe, and the He-gas return pipe supported by G10 posts. 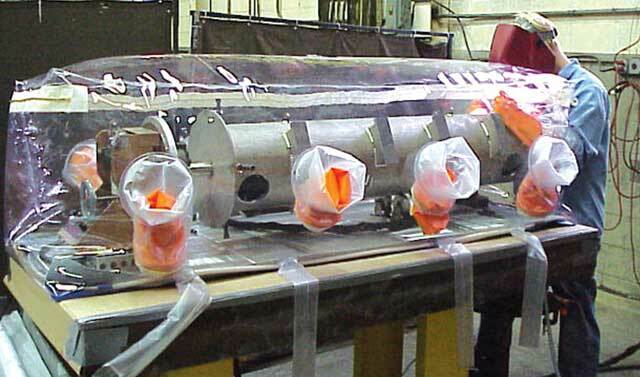 The cavity mounting and alignment structures were modified to simplify the alignment of beam line components. Meyer supplied components include the Cryostat Vacuum Vessel, (1 meter diameter x 8.5 feet long), the Support Posts, the Titanium He Gas Return Pipe, the titanium and stainless steel support and alignment components, the cryogen piping, the magnetic and aluminum shield assemblies with assistance from subcontractor Amuneal, also a CSA Corporate Sustaining Member.